Wine is one of the most popular drinks in the world but if you have to enjoy its real flavor it is essential to store the bottles properly. Ideally, wine should be stored in wine cellars, as these places are able to maintain the right level of humidity and the right environmental temperature, but not all of us have the fortune of owning such a place. So, for all of the wine enthusiasts or winemakers, some manufacturers make the great fridges (as you can see in our buyers guide here). 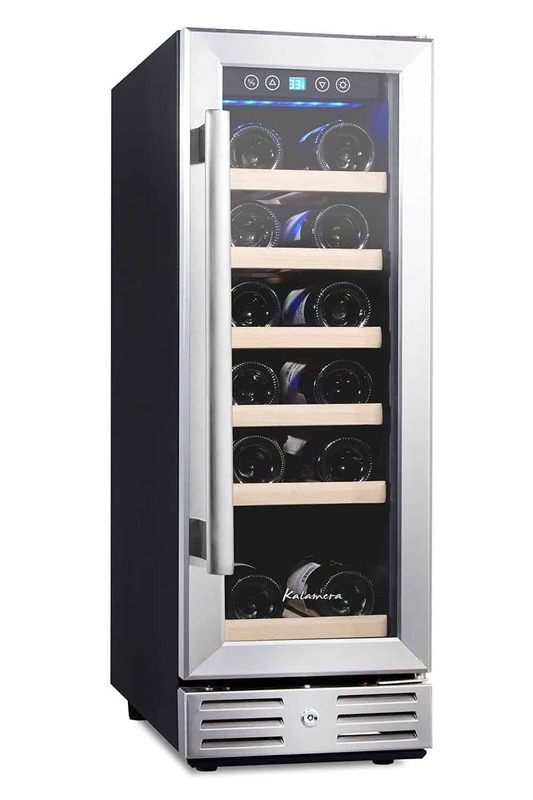 A wine cooler is an appliance very similar to a refrigerator that is manufactured in many variations to meet all aesthetic and functional needs. Many manufacturers even produce small under counter wine coolers, ideal for all those who have little space in their homes or for those who own a wine business and need to chill a few bottles away from the eyes of the crowds. To help you choose the best small under counter wine cooler, we put up this list of small under counter wine cooler reviews. But first, let’s find out more about these useful appliances. How To Choose A Wine Cooler? If you want to maintain the organoleptic characteristics of your wine unchanged over time, you need to store the bottles in a moist and cool environment. The desired humidity should be between 75% and 80%, to prevent both the formation of mold and the corks from drying out. However, the humidity is not the only factor to consider if you want to maintain the quality of your wine. Depending on the type of wine you want to preserve, you should also determine the right temperature. For sparkling wines, including champagne and prosecco, the temperature should be between 39 and 46 degrees Fahrenheit. The white wine, as well as the rosés, should be preserved at temperatures between 42 and 54 degrees Fahrenheit, while the red wines keep their characteristics at temperatures between 50 and 64 degrees Fahrenheit. So, depending on the type of wine you want to collect or make, you should choose a wine cooler that can preserve the wines at the right temperature. The first thing you have to decide when choosing a wine cooler is whether you want to use this appliance to store the wine for a longer period of time or just to chill the wine before serving. In the first case, in addition to choosing a wine cooler that can be set at the right temperature, you should also be careful to buy a model that can also maintain the desired humidity. In the second case, you should focus more on the cooling characteristics and make sure you know well which is the serving temperature of the wine you have. If your collection is made of different types of wine, you should probably choose a dual zone wine cooler. A dual zone wine cooler is also a good choice if you want to use the same unit for both storage and cooling before serving. If you plan to preserve your wine in a wine cellar and use the wine cooler only to chill the drink before serving, then a small under counter wine cooler might suffice. Optional features such as dual zone cooling, safety lock, digital controls, etc. Freestanding coolers: models very similar to the regular fridges, manufactured in a wide variety of sizes. These wine cooler﻿﻿﻿s are very versatile because their design usually allows you to place them anywhere, from the kitchen to the living room or even inside the wine cellar. Countertop coolers: ideal for those who have little space or for those who need a wine cooler only to chill the wine before serving and not for preserving it. These models are very compact and, usually, you will not be able to store more than 24 bottles inside these appliances. Built-in coolers: these wine coolers are also ideal for those who have little space available in their homes, but they can also be an option for those who have a wine business and want to invest in a cooler to chill the wines before serving. The difference between these coolers and all the others is that they don’t need any space around them for ventilation. However, you should never install a wine cooler in a cabinet if the manufacturer doesn’t clearly specify that it is safe to do it. Most of the built-in appliances are small under counter wine coolers. In addition to being compact, so ideal for any household, the small under counter wine coolers have a series of benefits. The first, and the most important, is that they are especially designed to store wine, so you will know that your precious drink is kept in the best conditions at all times. Even if you could install a regular minibar refrigerator under your kitchen counter, those appliances are just unsuitable for wine storage. Secondly, there are many small under counter wine coolers available on the market, so you will most likely find a model that matches your interior design. When it comes to storage capacities, there are various options available, and you can choose a wine cooler that can accommodate up to 24 bottles. Typically, all small under ﻿﻿counter ﻿﻿wine coolers have removable shelves made of either wood or stainless steel to ensure an optimal air flow. Since the shelves are removable, you will be able to adjust the capacity to your needs. Lastly, depending on the diversity of your collection, you can choose a single zone cooler or a dual wine cooler. If you’re worried about the price, know that most of these devices are affordable, so you will most likely be able to find a model that suits your budget. 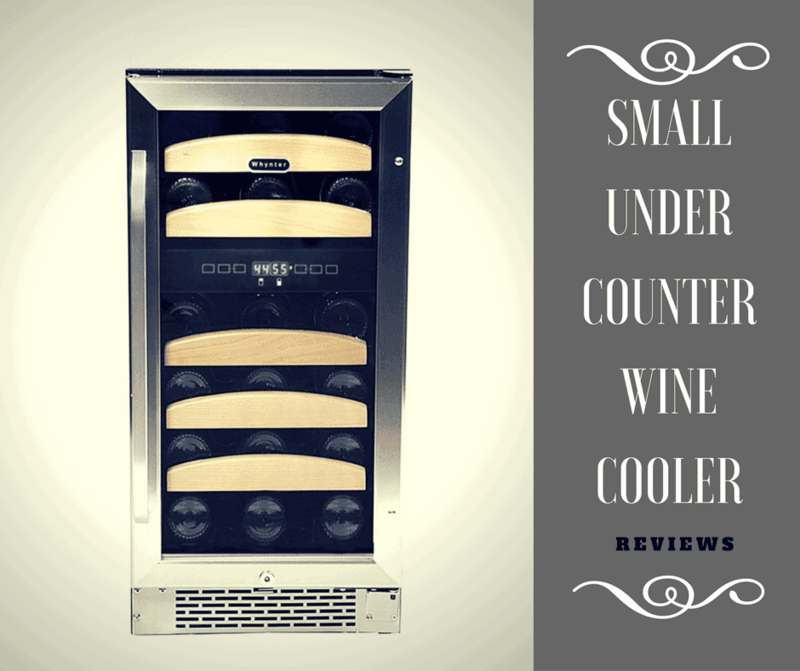 Now, read our small under counter wine cooler reviews to find out which are the most popular models available on the market. 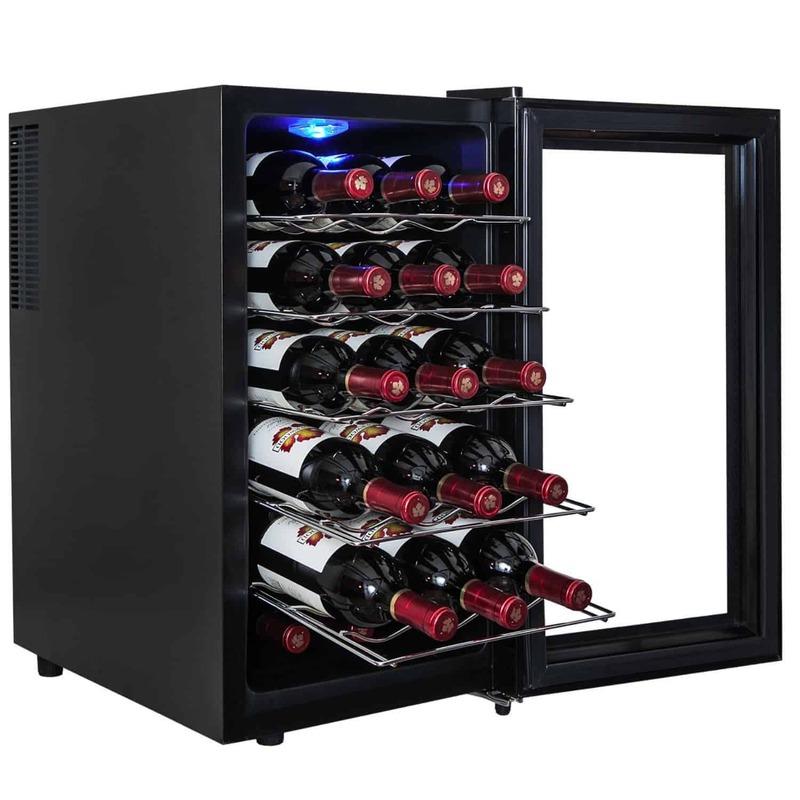 One of the most popular small under counter wine coolers is the EdgeStar 18 Bottle Built-In Wine Cooler. This unit has a slim and sleek design, being easy to integrate it in your under the counter of your kitchen cabinet. This unit can hold up to 18 regular size bottles and has a single cooling zone that can be easily controlled thanks to the integrated digital controls. The temperature ranges from 40 to 65°F, feature that makes this unit ideal for both preserving and chilling your drink. With its ultra slim design and beautiful finishing, this wine cooler can match with success any type of décor, while its anti-froze feature makes it safe for your wines. Elegant design: this wine cooler has a sleek and elegant design, featuring six stylish wooden shelves and a classic black cabinet. Tinted glass door: the tempered glass door presents a dot pattern to provide a more efficient protection against the UV light. Shelf bottle layout: to maximize the cooler’s capacity, the shelves are designed with a convenient layout. 12-inch width: space is not a problem anymore, since this unit has a width of only 12 inches and it fits easily in the narrow spaces. Being narrow, this wine cooler is designed for standard Bordeaux bottles. The larger bottles don’t fit well. With the same capacity of the EdgeStar, this wine cooler from AKDY represents another great alternative if you are searching for a small under counter wine cooler. This single zone unit uses the thermoelectric technology to keep your wines in the best conditions, being extremely quiet and with a zero level of vibrations. The temperature of this unit ranges from 50 to 66°F, being more suitable for the red wines instead of white and sparkling. Slightly wider than the EdgeStar, this wine cooler is still small enough to fit easily in a free space under your kitchen counter, while the chrome wine racks are slimmer and occupy less space inside the unit compared to the wooden shelves. Digital controls: this wine cooler is equipped with an electronic touchpad that will allow you to set the desired temperature. Celsius/Fahrenheit display: you can choose your favorite metric unit, a useful feature especially if you have a collection of foreign wines. Quiet operation: the thermoelectric cooling system has a really quiet operation and an extremely low level of vibrations. 1-year warranty: the manufacturer offers a one-year warranty for the parts in case of manufacture defects. 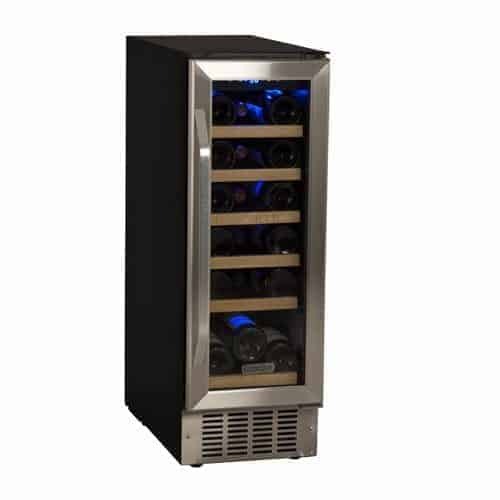 Like many other small under counter wine coolers, this unit is not able to fit well large wine bottles, such as bottles used for chardonnay or champagne. Small, boasting a sleek design, and extremely reliable, the Kalamera 12-inch wine cooler is a unit that will fit perfectly under your counter and will enhance the design of your kitchen. Equipped with six elegant wooden racks and with a convenient soft blue lamp, this wine cooler can accommodate up to 18 standard size Bordeaux bottles. If you want to store larger bottles, you can remove and rearrange the shelves based on your needs. The double-layered tempered glass door will keep your bottles away from the harmful action of the UV light and it will not fog, so you will be able to admire your wine collection at any time. Although it is a compressor wine cooler, the advanced technology used in the construction of this unit makes it really silent and the level of vibrations is reduced to a minimum. Safety lock: if you want to keep your wine safe from the children or any other unauthorized access, you can simply lock the door. Wide temperature range: the temperature ranges from 40 to 66°F, making this wine cooler perfect for both red and white wines. Dual temperature display: you can choose to set the temperature in Celsius or Fahrenheit degrees, depending on your preference. Stylish design: the black cabinet is enhanced by the stainless steel trim of the door, the unit being very stylish. Some users complained about the ineffective customer support. If you have a larger wine collection but not enough space for a large wine cooler, then this small under counter wine cooler from Koldfront might be the right choice for you. This single zone compressor wine cooler can accommodate up to 30 standard size wine bottles, having six full size chrome shelves and a smaller shelf on the bottom. To ensure easy access to your wine, all the shelves slide out easily. The cooling temperature varies from 40 to 65 degrees Fahrenheit, so you will be able to use this cooler for any purpose and for any type of wine. Digital controls: setting the temperature and controlling the well-functioning of this unit is simple, thanks to the digital controls and temperature display. Soft blue light: to enhance the beauty of your wine collection, and to let you easily spot the desired wine, this unit is equipped with a soft blue LED light. Reversible door: you will be able to integrate this unit regardless of your home décor, thanks to the reversible door. Compact dimensions: even if it has a large capacity, this unit is really small, being only 15 inches wide and 32 inches tall. This wine cooler is a bit noisy compared to other similar wine coolers. The last small under counter wine cooler we recommend is the Whynter BWR-281DZ, a dual zone wine cooler that can accommodate up to 28 bottles. Ideal to fit under your counter, this unit has a width of only 15 inches, while the beautiful design and the attractive wooden racks make this wine cooler a perfect fit for both modern and classical interiors. 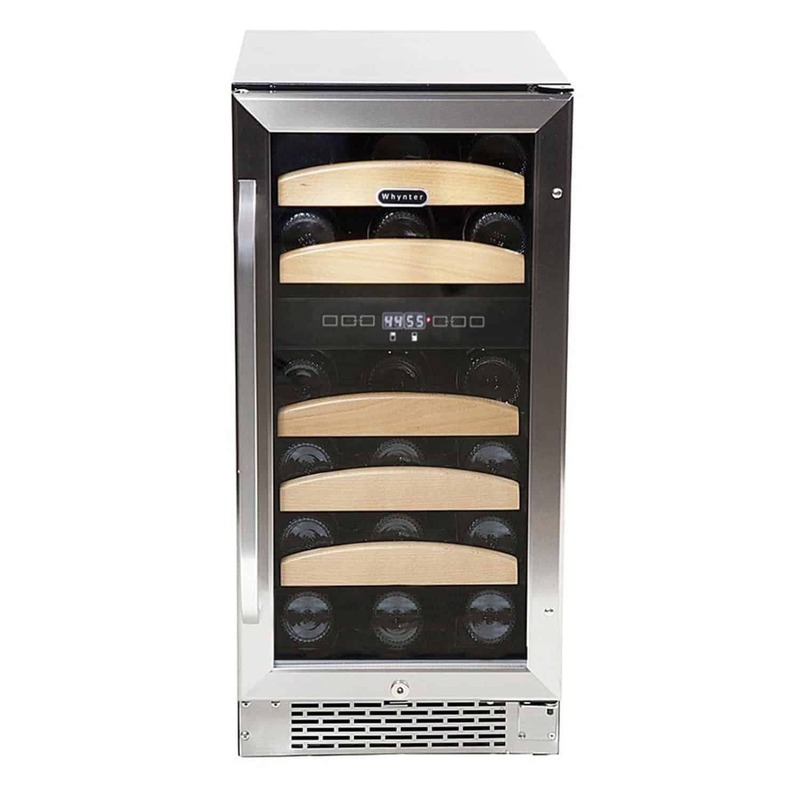 Ideal to keep a collection of both red and white wines, the wine cooler is divided into two temperature zones. The upper zone can cool the wines to temperatures between 41 and 50°F, while the lower zone from 50 to 72°F. To help you store any types of bottles, this wine cooler features five removable slide-out shelves. For standard size bottles, this wine cooler can accommodate 18 bottles in the lower compartment and 10 bottles in the upper compartment. Digital control: setting the temperatures of either of the two zones is easy, thanks to the convenient digital control. Dark glass door: for a better protection against the UV radiations, the door is made of double dark tempered glass. Sleek design: to fit in all home décors, this unit has a sleek and elegant design. Convenient functions: if anything goes wrong, the unit has a malfunction warning system. In addition, the unit is also equipped with a temperature memory function. Some users complained about the wooden shelves not being of a high quality. It also seems that the overall capacity of this wine cooler is smaller than advertised. When it comes to choosing the best small under counter wine cooler, there are some high-quality options available on the market. Depending on how large your wine collection is, or on your preferences, you can choose a single zone or a double zone wine cooler. 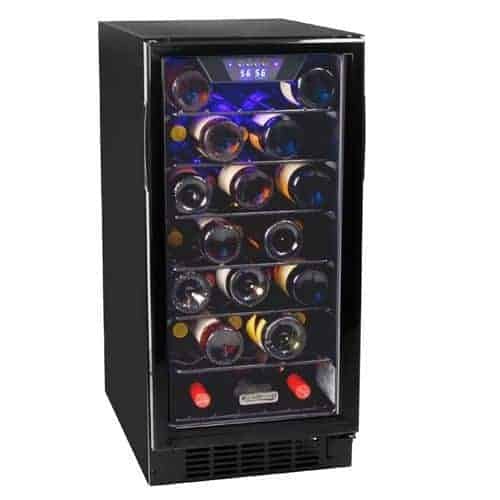 However, our favorite small under counter wine cooler is the EdgeStar 18 Bottle Built-In Wine Cooler. Even if it is less versatile than the double zone units, this wine cooler has the right dimension for an under counter unit, its 12-inch of width making it perfect to fit even in the narrower spaces. Large enough to accommodate up to 18 bottles, this wine cooler can either preserve your collection or chill your wines before serving. It might not be suitable for a more varied collection of wines but the truth is that if you have some prestigious wines it is a pity to keep them hidden under the counter anyway. On the other hand, if you like to make your own wine, you will probably have to preserve only one type of wine in this cooler, the single temperature zone making the unit perfect for this purpose especially if you don’t have a cellar. All these characteristics make this small under counter wine cooler the best one available on the market.